Dates: starts from 14th November with lectures and flexible tutorials on Mondays/Tuesdays/ Thursdays 9 a.m.-12 p.m. arranged according to the possibilities of a student. An intensive all-day workshop with ELLEN VAN LOON/OMA on Tuesday 22nd November in the Main Building of School of Business (Runeberginkatu 14–16). The final review on 8th December 9 a.m.-12 p.m.
ARK-E5003 Special Course in Urban Planning and Design, 2 credits. Maximum 10 students accepted. 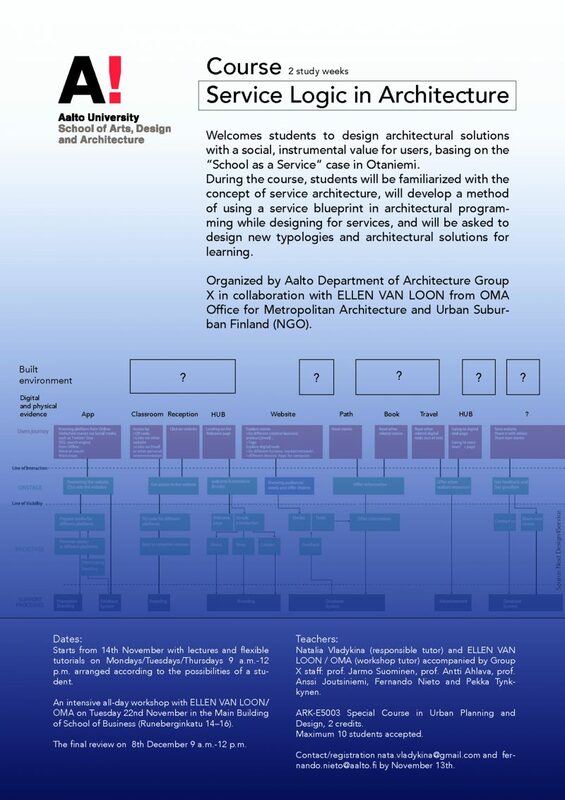 Contact/registration nata.vladykina@gmail.com and fernando.nieto@aalto.fi by November 13th.